The six California Affiliates of Susan G. Komen® are proud to support removing the treatment caps in the State’s Breast and Cervical Cancer Treatment Program (BCCTP). At Susan G. Komen, our mission is to save lives and end breast cancer forever by empowering others, ensuring quality care for all and energizing science to find the cures. Breast cancer affects far too many Californians – it is estimated that approximately one in every eight women will have breast cancer during their lifetime. The BCCTP provides necessary cancer treatment to low-income, uninsured or underinsured individuals diagnosed with breast and/or cervical cancer. Under current law, the state-funded BCCTP is not aligned with the federally-funded BCCTP, causing gaps in service and treatment for women diagnosed and treated through the state-funded program. Under the state BCCTP, treatment coverage is limited to 18 months for breast cancer and 24 months for cervical cancer. It is also important to note that, currently no other health insurer imposes treatment caps. The state only BCCTP provides services to three important groups of women – those who have purchased insurance but are underinsured, women regardless of their documentation status, and women newly employed and in the probationary period of their health insurance. 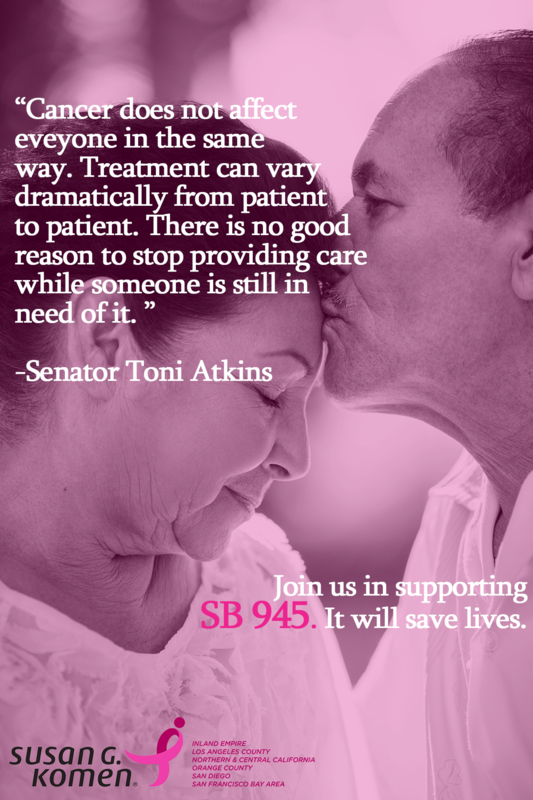 Breast cancer knows no standard timeframe, and we believe that Californians should finish treatment when their body is done fighting, not based on an arbitrary amount of months. For these reasons, we support funding SB945 to remove the treatment caps within the state-funded BCCTP.